Thank you for stopping by this website. 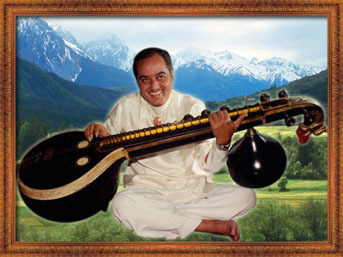 The fact that you are here reveals that perhaps, Indian Classical Music, Veena, and Chitti Babu mean something to you. We appreciate your interest to know more, and hope you find browsing around this site an enjoyable and rewarding experience. More than being just a source of information, the idea is also to give you a glimpse into the mind of the genius and the man who spread so much love and happiness to all the people he came in touch with in his eventful life, through his divine music and genuine warmth. 2 new sections: His Better Half; His Accompanists and also some edits to include some names of his disciples.